We can fit our telescopic shafts to any common head that you supply or choose from a supplier for the same price as our currrent web-special pricing for the same type of club. There is no discount if you supply the head because we have to cut and machine the shaft to fit your head. We can't use any of our normal cutting templates, so there is more shop-time required. For instance, if you want a custom driver and supply the head, the cost for us to fit it to a telescopic shaft would be the same for our T&F Driver which is $199 this month. Putters are $129. Hybrids, Wedges, and other irons or chippers are $139. We can even make 9-Foot long putters like we did for the Werner Ladder Company shown in the accompanying photo, or the 12-Foot Driver we made for Peter Jöhncke, The Trick Shot Master. If you want to order a telescopic club that is not one of our normal selections, please let us know what you want and we will send you pictures and specs of available heads along with ordering instructions. Or, if you want to supply the head, just let us know what it is. We provide an additional 10% discount if you order 3 or more clubs. Please review the following points as you consider this option. Collapsed Length: Except for the Whole-In-One Adjustable Golf Club which is designed to use a 3-piece shaft which collapses to less than 18 inches, all other telescopic shafts are 2-piece shafts and do not collapse as short. There are two reasons for this. Drivers and fairway woods are longer when extended, and there isn't enough shaft to make them 3-pieces and still telescope out to the desired playing length. Irons and putters have a .370 inch hosel socket which isn't small enough to allow for 3 sections. In other words, it doesn't provide enough differential from the .600 inch grip-end to the tip-end to allow 3 sections. Think of it like stacking cups. The smaller the bottom of the cup = the greater the angle of the sides = the deeper the top cup will fit into the bottom cup as illustrated in this picture. The green cups represent shafts with .335 tips and the red cups represent shafts with .370 tips. Telescopic drivers collapse to about 26 inches, depending on the head (some heads have taller and wider bodies than others), and all other conventional irons and putters collapse down to 21 to 24 inches. From a travel point of view, drivers fit diagonally in medium to large roller bags, so other clubs should fit easily. Larger "rolling duffel bags" are not expensive and can accommodate several clubs and shoes in one section and all your clothes in another. Click the accompanying picture to see a great way to fit our telescopic clubs into an airline-checkable travel bag. 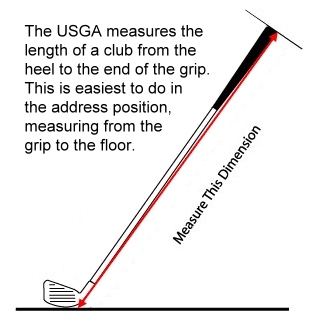 You can choose the extended club length, measured as shown below from the heel to the end of the grip. The easiest way to measure is to put the club in the address position, then measure from the end of the grip down to the floor along the back of the shaft...illlustrated by the red line. We then apply a cutting formula that includes measurements of the hosel height and depth so that the collapsed length is as short as possible. In other words, the inner shaft head section will fit fully up into the larger grip section. Curved Putter Shafts: We can make custom threaded couplings for curved putter shafts. Click here to read more about that option. Half or Full Sets: Some people have purchased half sets of telescopic clubs, and include a Sunday Bag to make it easy to carry. We have even had customers who have purchased full telescopic sets with conventional irons or hybrids. But that is rare. Telescopic, not Adjustable Length: It is important to understand that “telescopic” does not mean “adjustable length ”. Telescopic shafts are either extended for rock-solid play, or collapsed for travel. Of course, you can easily modify the length by choking up or down on the grip. But the shaft itself is not adjustable length. It cannot be locked in intermediate positions. Flex: Because the most important thing to most customers is for telescopic clubs to be as short as possible when collapsed, we have less control over the flex. And because these clubs are used mostly for travel, the flex isn't as important as traditional custom-fit clubs. So we are not able to offer variable flexes with telescopic shafts. Club Selections: Some people just purchase a wedge so they can practice their swing in a hotel. A wedge is a good choice because of its weight, and the short shaft so you don't hit the ceiling. Of course, it can also be used for actual play. Head Choice: You can either send us your head, or we can get any popular style component heads from Hireko Golf (www.hirekogolf.com) or another component supplier. If you want to look at that website and let us know your selection, that will save time. Or, you can send us your head. Shaft Removal: If you send a complete club and want us to remove the shaft before installing a telescopic shaft, that is a $15 cost assuming it is a standard epoxy-fitted shaft as are most clubs. If your club is a PING which uses a frozen ball-bearing to secure it to the head, there are additional charges and implications. Please ask us about that before you submit your order. Parallel Tip Shafts: Please note that we only inventory "parallel-tip" telescopic shafts. If you have a head that uses a tapered shaft, there is an additional $15 charge. Most clubs use parallel tip shafts. Timing: It normally takes 7 to 10 days for us to bring in a head and install it on a shaft. Shaft Only - Self-Install: Some customers want to purchase a telescopic shaft, along with our stainless steel collapsing cap, then install it themselves on their own head. They often want to install their own preferred grip. We can sell it that way for a self-install, but the cost is only reduced by the cost of the equivalent head from our foundry supplier so there isn't as much savings as one might imagine. There is a downside of doing this. If we don’t have the head to measure the hosel length and depth, we will not be able to apply our cutting formula to yield the shortest possible collapsed shaft which most customers want for convenient travel. In other words, with a generic telescopic shaft, the grip section will not collapse all the way down to the top of the hosel and the resulting collapsed length will be longer than necessary. Therefore, we do not recommend self-install. However, if you want to consider that further, click here to read more shaft-only-self-install options. Guarantee: We guarantee the shafts will lock and perform solidly, but unlike our standard telescopic clubs, we are not able to offer a satisfaction guarantee on custom clubs because we have no demand for them from our normal customers. Most customers who order custom clubs have already experienced the performance of our Whole-In-One Adjustable Clubs, so they have full confidence. Summary - Before You Order: If you want to order a telescopic shaft on any head other than our standard options listed at the top of this page, let us know what you want. After we have all the information, we will reply with the payment steps since we don't have custom club options in our secure online store.